When it comes to water remediation, landscape architects own this. 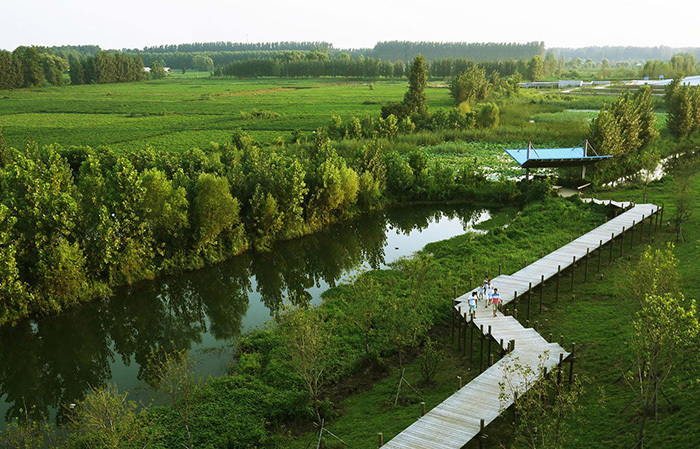 Weishan Wetland Park sets a new paradigm for large parklands and the balance between water remediation, wetland conservation and tourism development in rapidly changing societies. 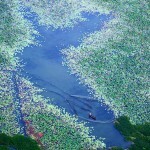 The site – Asia’s largest lake wetland – was falling into decline from years of poor agricultural and aquaculture practices. 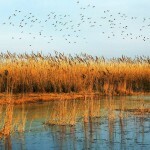 One of the key design goals is to restore water quality and environment of the regionally significant wetlands. 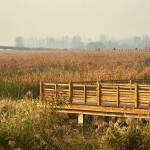 The park transforms a rural wetland site into a significant destination for science education and ecological tourism, stimulating economic development in neighboring urban areas while contributing to environmental protection of waterways along China’s ambitiously engineered South-North Water Diversion Project. Since its completion, local wildlife previously rarely seen have returned, testament to the health of restored waterways, ecosystems and habitats. △ 原始的基地内有丰富的自然资源和多样化的生态环境，但景观特征相对模糊。生态和环境条件相对没有受到干扰，但基地内农业活动已经导致了某些区域严重的环境污染。The original site boasts abundant natural resources but landscape character is relatively indistinct. Ecological and environmental conditions were relatively undisturbed, but agricultural activities has caused significant environmental pollution in some areas. △ 经过人工湿地的处理，水重新汇入微山湖。微山湖的无边荷景广为人知。After treatment by through constructed wetlands, water flows back into Weishan Lake, famous for its lotus plants. △ 甄选当地湿地植物物种用于不同区域，通过水体分流提升水质，塑造可持续的、健康的湖泊栖息地。A selection of local wetland plants are used in different areas to improve quality of water from the water diversion, creating a sustainable and healthy lake habitat. △ 通过分层和多样性种植营造四季变换的景观特色。通过增加本土动植物群，该区域已经被恢复成一处生机勃勃的、适用于室外科学教育的景观。To create seasonal landscape features through the use of tiering and diverse variety of planting. By increasing the types of local flora and fauna, the site is restored into a robust diverse landscape suitable for outdoor science education. △ 竣工后的湿地面积达到200公顷。最高效的时期，化学需氧量消除率估计可达百分之50，磷消除率接近百分之60，氨消除率高达百分之65。The completed wetlands covers 200 Hectares. At peak efficiency, COD (chemical oxygen demand) removal rate is estimated at 50%, total phosphorus removal rate approximately 60%, and ammonia removal efficiency is up to 65%. △ 设计师将观鸟走廊同环境揉为一体，降低人行交通对鸟类栖息地和鸟类活动的影响。The bird viewing corridor is designed to blend into its surroundings, and to reduce impact of pedestrian traffic on bird habitat and activity. △ 木栈路网和观景平台贯穿整个基地，为游客营造了多样而丰富的在芦苇地和杨树丛之间穿梭的景观体验。A network of timber boardwalks and viewing platforms weaves across the site, providing ample opportunities for diverse landscape experiences through reed beds and poplar groves. △ 木甲板使用产自当地的材料，这是该项目微创设计策略的一部分。The timber decks are constructed out of locally sourced materials, as part of the project’s low-impact design strategy. 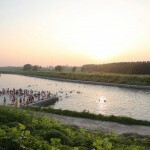 △ 水质变好了，人们可以在湖中游泳了。With improved water quality, people are now able to swim in the lake. △ 诸如太阳能、风能之类的绿色能源被用来为包括科学监测设备在内的公园服务设施提供电力。Green energy, such as solar and wind power, is used to power park services and facilities, including scientific monitoring utilities. △ 微山湖的荷对当地文化和经济来说具有重要意义。这座专门委托设计师设计的当代雕塑是公园入口的标志。Weishan’s lotus is both culturally and economically significant to the local area. This specially commissioned contemporary sculpture marks the entrance of the park. △ 重新建成的“有机”护壁所使用的材料是基地内的柳枝和杨树桩。来年春天，盘覆在木桩四周的柳枝生根发芽，起到固定周围土壤的作用。The organic revetment that required reconstruction is made of on-site wickers and poplar timber piles. Wickers woven around the timber piles will sprout the following spring, firmly consolidating and stabilizing the soil mass around them. △ 经人工湿地处理后的湖水适宜人们在其中嬉戏。After treatment by artificial wetlands, water in the lake is suitable for recreation. The wetland park, located in the south of Weishan County in Jining, Shandong Province, forms part of the eastern route of China’s South-North Water Diversion Project, a multi-decade infrastructure project to provide reliable water supply to China’s arid north. Situated away from major economic centers, the site has limited transport connections to neighboring urban areas, and lacks tourism infrastructure and supporting services. Ecological and environmental conditions at the site were relatively undisturbed, but ecological connections with the wider region are poor and the presence of agricultural activities has resulted in significant environmental pollution in some areas. There are abundant natural resources and diverse landscapes within the site but landscape character is relatively indistinct. 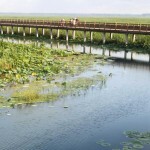 In 2008, the team was appointed by local county government to develop a tourism development and environmental conservation master plan and landscape design for a wetland park. Landscape planning of the project covers a research area of approximately 40 square kilometers, with a first phase design area of approximately 2000 hectares. 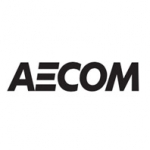 Construction began in May 2010, with an estimated cost of $42 million (approximately RMB 260 million). 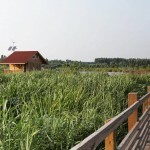 Stage one of the park development – the Weishan Wetland Park – was completed and opened to public in May 2013. 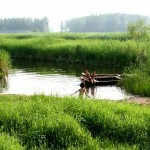 In the same year, it was voted one of the most attractive wetlands in a nationwide poll by China’s State Forestry Administration and CCTV. 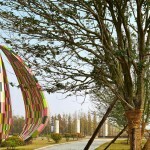 Led by landscape architects, a multi-disciplinary team brought together master planners, environmental planners, ecologists, economists and architects to plan and design a new paradigm of parkland for this part of China. Given the complexities and ecological fragility of the site, the team conducted thorough research, analysis, field investigations and evaluations to understand the site conditions before developing suitable strategies and a comprehensive master plan. The project was realized in the following sequential phases. 8. Coordination during site construction. The design of the park brought together comprehensive planning, nature conservation and ecosystems management to maximize the potential of existing ecological resources and achieve operational flexibility. By weaving in local cultural elements with low-impact design strategies across scales, the team created a “poetic wetland of the north”, in local phraseology, which celebrates vernacular landscape and cultural characteristics, to achieve an aesthetically pleasing and sustainable low-carbon development. 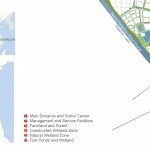 The result is a beautiful park and attraction that artfully integrates waterway improvements, ecological conservation, habitat restoration and tourism development. A total of five landscape zones were drawn up in relation to their ecological functions, areas each for core protection, natural restoration, limited human activity, development and a preserved village community. Several new and restored habitats were created: a manmade wetland, riverine wetland, permanent freshwater marsh, parkland, meadow, restored natural wetland, fishpond, farmland, and a water and development area. 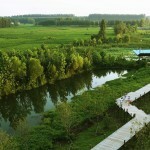 The site’s hydrology is influenced by the existing Weishan Lake, with high flood levels and considerable seasonal water fluctuations, which poses a significant challenge in landscape design. 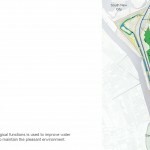 The water system design carefully considered existing topography, pond and river configurations, to create a living water network with high flood-safety, water connectivity with smooth flow. To optimize water environments, treatment wetlands were proposed at the inlet and the outlet to ensure not only the influent, but also the effluent, were of high standards. Meanwhile, best practice stormwater management was also implemented to maximize the control and removal of potential pollutants from the surface runoff. By analyzing current environmental conditions such as water bodies, vegetation and topography, and also potential pollutants from future human activities, a wetland purification system was established in areas with high pollution risk to ensure the water treatment. 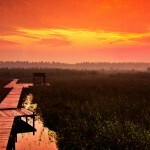 Created with local plants, multiple structured wetlands optimize purification efficiencies and landscape quality. A key goal of the plan was to establish a biological habitat network with a core habitat that would then anchor surrounding habitats of emerging ecological value. The team created multiple habitats (woodland, farmland and wetland) that optimize the riparian ecosystem and increase and intensify animal diversity. Typical local waterfowls such as Ciconiiformes, Gruiformes and Anseriformes species will have a higher probability to be observed in the future, and some bird nesting behavior and activity has now also become visible, which enhances the tourists’ desire to seek out the novel and ecological educational value of the park. 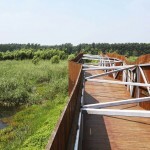 Wooden trestles that act as corridors for bird viewing are placed across the wetland. These light structures of wood and steel are gently placed in the landscape to minimize their footprint on the area. 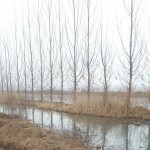 New soft soil revetments on the site were built using a simple system of existing willow twigs and retained poplar piles. The twigs embracing the timber piles will sprout and immobilize the surrounding soil levels. Battery lanes and major footpaths are paved in permeable gravel; and, isolated small service facilities run on solar and wind energy that powers their illumination. The plan strictly controls vehicular access in the park. All visiting cars must park outside the park by using an existing road that has been separated from the resort and protection area to minimize impact on habitats. Most roads in the park have non-motorized vehicle lanes and footpaths, and there is provision for water-based transport. The road and water transportation systems form two circuits, serving as the main modes of transportation in the north and south respectively while achieving different transfer modes. As some of scenery spots can only be viewed by boat, motorways are mostly located nearby major functional zones. Finally, the plan modified and optimized existing roads to reduce their impact on environment. 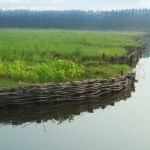 Site habitats such as water bodies, wetlands and forest are protected and optimized by improving the current relatively lower land plant diversity, mitigating the phenomena of exotic algae species invasion in the area’s aquatic territory; we deployed native plant species in the forest and wetland restoration, further improving the plant community’s ecological value. A diversified plant community structure (of trees, shrubs and grasslands) help to create a seasonal green space landscape feature that enriches the park’s natural diversity. Along with the rest of the design, the architecture of the visitor’s center utilizes green roofs, and its form mimics the terrain along the slope downward, creating a mesa drop rain gardens where roof rainwater is collected and processed and then discharged into water bodies near the bottom of a wall using local natural stone masonry. Small independent service facilities all use solar and wind power as the power source for lighting.